← When Do You Push Your Kids in Sports, Music, Activities and How Do You Build In The Right Stuff? Friday was a rough day. I woke up at 3:00 a.m. with my left eye on fire and watering like a fountain. I made it through the night and was waiting at the Doctors office when they opened. I had a small piece of fiberglass lodged in my eyelid that worked over my eye during the night. The Doctor removed it and I was late to work on Friday. I struggled through the day with lingering pain so that I could attend the funeral of one of our employees of 52 years. By the time I got home all I wanted to do was close my eyes and go to bed. It was my wife’s birthday and we planned to take her out for dinner. I certainly was not much fun at dinner and promptly climbed into bed when we returned home. Could it possibly get worse? 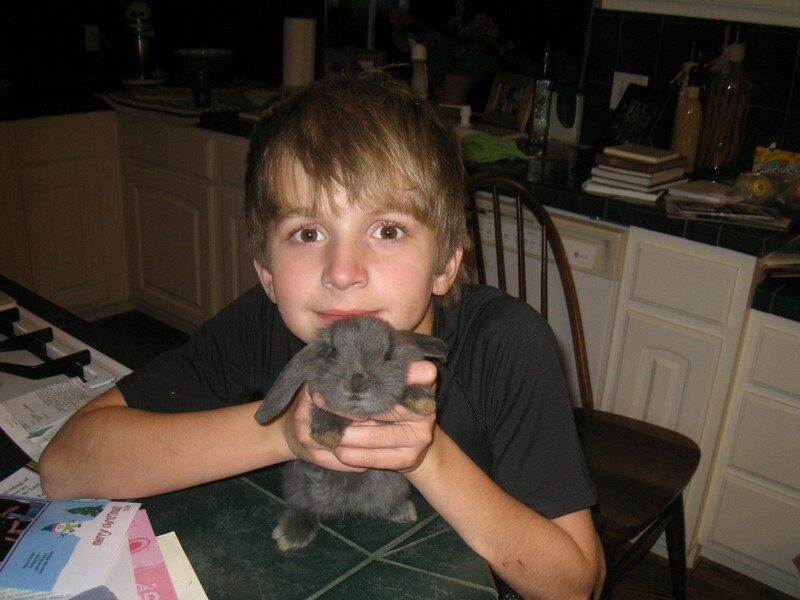 Sound asleep, I was awoken with crying and distress by the family telling me that Mason, our pet rabbit had died. Saturday morning we prepared a proper burial for our pet Mason. The death of a family pet is a significant event in the life of a child. In many cases it is the first time they have experienced death and mourning for the loss is a new emotion. I had to think about what to say and how to use this experience to bring the family together and teach of God’s love for us. The following are some of my thoughts and our experience in saying goodbye to our beloved pet, Mason. Be sensitive – Crying and grieving over the loss is natural and is a natural reaction. It is OK to be sad. Some are more affected than others and it is important that we recognize their feelings and emotions. We can comfort each other and support each other in the loss. Talk about the experience – We talked about the good memories that we had with Mason and reminded each other of the stories of Mason as the runt of the litter that was irresitable, swimming in the pool, and playing chase in the yard. Have a ceremony – We have lost other pets such as fish or birds that did not get the respectful burial. Mason was different and burial was the right thing. Pick a nice spot where you can remember your pet and you may even want to mark the grave in remembrance. The act of preparing the grave and burial gives us a visible and final event to say goodbye and bring closure to the event. Turn our attention to God – Genesis 2:19 tells us that God created all the animals. God blesses us with good things including our pets that we learn to care for, love and enjoy. We said a prayer of thanksgiving for Mason and prayed that we would treasure every life given to us, and asked God to comfort us in our loss. The last word. It is OK to have two birthday celebrations for your wife. We will be celebrating my wife’s birthday again with family on Sunday as the chaos subsided and we can enjoy and celebrate the great blessing she is to us. This entry was posted in Meet the Applegates, Rites of Passage and tagged christian family book, family books, family core values, focus on the family, Jeff Applegate, losing a family pet, parenthood, parenting articles, parenting blog, parenting books, parenting tips, Raising children, rite of passage. Bookmark the permalink.